I went to see this movie on opening day 1993 and a few more times in the following weeks. I had no children with me. I also bought the VHS tape when it came out, the soundtrack, and later the DVD. I may or may not have some small toys from the movie and a few TNBC T-shirts over the years, one possibly bought as recently as today. To say I love this movie is too serene. 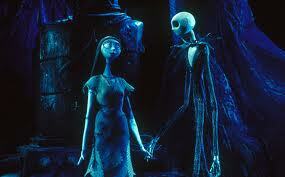 Like most Tim Burton films TNBC is funny, dark, deep, and stabbed full of obvious messages. 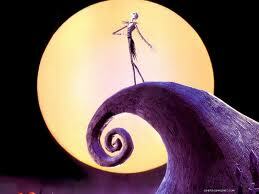 The main character is a skeleton named Jack Skellington. 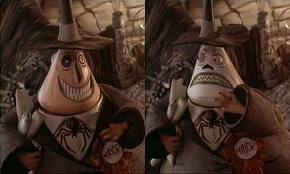 He’s the Big Mouldy Cheese of Halloween Town, he’s the Pumpkin King, he has it all, fame, fortune, adulation. But he’s bored with his job. He wants more. He discovers Christmas Town and sees it’s marketing potential. He figures this must be what he was destined to do. So he rebrands himself and retrofits Halloween Town to do this new gimmick, Christmas. Things go terribly, dreadfully, horribly wrong, of course. The day or should I say eve is saved, mostly with the help of Sally who has loved Jack just as he was. The Christmas brand is salvaged, as is that of Halloween. 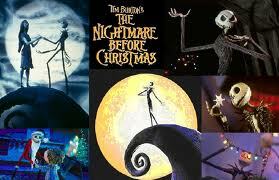 Short story extended, Jack realizes he had everything he needed to make him miserably happy in Halloween Town all along. Cue a gruesomely romantic scene. Crushed into all that? Lots of cool songs by Danny Elfman (sigh, I still love Oingo Boingo), mayhem, fun, drama, lots of funny lines…one of the best films every made. It’s a marketing dream in one nightmare. 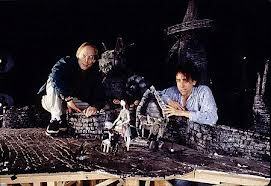 The making of this film is almost as interesting as the film itself. Astonishing. Many have poached from, peeled back, and tried to copy the mastery of this movie in the 20 years since it’s release, but this masterpiece is incomparable. Makes sense that it’s really just a remake of another perfect classic, Dr. Seuss’s How the Grinch Stole Christmas. Can’t see it? Think about it. TNBC combines Christmas and Halloween so naturally, I’m in. This is a delightful review, Donna. I’m so glad you included the link in your most recent post. That’s a great point about it being like the Grinch. I never thought about that. I hope you are having a great week. Mega hugs!